English Gardner keeps getting faster! Would you believe 10.79? OMG!!!!!!!! Eastern High School graduate English Gardner continued her resurgent 2015 season in Eugene this weekend, lowering her PR from 10.84 to 10.79 and moving up from No. 12 in U.S. history all the way to a tie for No. 7. Gardner’s is now fastest in the world this year, tied with Shelly-Ann Fraser-Pryce, who ran the same time in Kingston, Jamaica, on the same day. This is the second PR in three weeks for Gardner, who lowered her lifetime best from 10.85, set at the 2013 nationals in Des Moines to 10.84 three weeks ago on the same track at Hayward Field on the University of Oregon campus in Eugene where USATF nationals are being held this weekend. Gardner’s best last year was 11.01, so she’s already a ridiculous 22/100ths of a second faster this year than last year. With her second-place finish, Gardner earned a spot on the U.S. team that will compete in the IAAF World Championships in Beijing Aug. 22-30. Gardner ran her 10.79 with a legal 1.5 wind in the trials on Friday. She followed with a 10.84 with 1.5 in the semifinals and a 10.86 with a 1.2 in the final, where she finished just behind Tori Bowie, who ran 10.81. 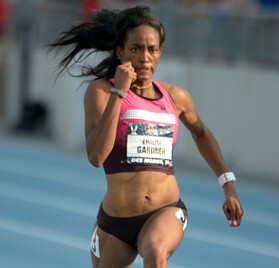 Gardner is also the fastest Amercan in six years, since Carmelita Jeter ran 10.64 in 2009. Two of the six Americans in history faster than Gardner — Marion Jones and Torri Edwards — were suspended for banned substances. Another, the late Florence Griffith-Joyner, was long suspected but never caught. Lenape grad Thompson an NCAA medal contender in intermediates!!! Lenape graduate Evann Thompson is enjoying a big year at Pitt and was one of the top qualifiers over the weekend for the NCAA Division 1 track championships. She goes into NCAAs as the No. 6 seed. At the East Regionals in Jacksonville over the weekend, Thompson advanced easily with a 58.37 in the first round and followed that up with a season-best 57.02 for second place in the next round — the regional final is actually considered the NCAA quarterfinal. Thompson was the third underclassman across the line. Thompson’s previous season best was a 57.33 from two weeks earlier, when she placed second to Sage Watson of Florida State at the ACC Championships in Tallahassee. Her PR is a 56.87 from East Regionals last year. She did not have a great race at nationals as a sophomore, running 58.89 and placing 17th overall. That 56.87 is the Pitt school record. She is also the school record holder indoors with a 1:30.98 for 600 meters. She’s also run as fast as 2:10.21 for 800 meters — an event she never ran in high school. Thompson is the No. 6 seed at the NCAA Championships, which is scheduled for June 10-13 at Hayward Field in Eugene, Ore.
Thompson had a PR of 1:01.99 during her years at Lenape. She was state champ in the 400IH as a senior in 2012. A breakdown of Thompson’s season, with her top performances in all her various events is here. For a complete list of all men’s and women’s NCAA qualifiers, click here. Thompson is also ranked No. 20 among all U.S. women and No. 54 in the world. She’s also only 13-100ths of a second off the 56.89 qualifying mark for the USATF nationals, June 25-28, also at Hayward Field. Her 56.87 last May came about a month before the qualifying window opened. Palmyra soph Carmichael bombs her way to state discus title!!!! Two weeks ago, Tomara Carmichael’s discus PR was 106-5. Not bad for a sophomore. Now? She’s added more than 20 feet to that PR and finds herself a sectional champion, a state champion and the top Group 1 thrower at states in more than a decade. The improbable story of Tomara Carmichael starts last spring. She threw 36-6 1/2 in the shot and 106-5 in the discus, making her the No. 1 freshman in South Jersey in the shot and No. 2 in the disc, behind Gabriel Harris-David of Timber Creek, who threw 114-8. She even placed fifth at states in the shot, making her the first Palmyra girl to win a medal at the outdoor state meet since 2008, when Rejeana Marigna tripled the 100, 200 and 400. This year, Carmichael won both throws at the BCSL Freedom meet and was top-three in both at the County Open. She extended her shot PR to 36-6 3/4 with a third at sectionals in the shot and PR’d at 119-5 for second at the Open. But the big breakthrough came this past weekend at Egg Harbor, when she added another eight feet to her discus PR, hurling the platter 127-9 to win the state Group 1 title. She was also second in the shot, giving Palmyra 18 team points. Carmichael is the first Palmyra girl ever to win a field event at the state championships. She missed the meet record of 134-4 — set in 1991 by Karen Schwartz of Mountain Lakes in 1991 — by less than seven feet. And she has two years to go. Her winning throw of 127-9 is the best in the Group 1 state meet in 12 years, since another BCSL Freedom Division thrower, Rose Perry of Riverside, won with a throw of 128-8. She’s the first sophomore to win the state Group 1 discus title in at least 20 years. Official results don’t list class before 1996. Overall, Carmichael goes into the Meet of Champions Wednesday ranked No. 8 among all entries and tops among South Jersey throwers, two inches ahead of shot put state champion Ronetta Hunter of Burlington Township.